Join Aullwood on Saturday, February 16th, from 6 to 9pm for Beer & Brewing with A Taste of Aullwood. Enjoy the relaxing and fun atmosphere of the nature center at 1000 Aullwood Road while partaking of samples from ten local restaurants and caterers including Christopher’s Restaurant & Catering, Company 7 BBQ, McAlister’s Deli, Mrs. B’s Catering, Ray’s Wine Spirits Grill, Rob’s Restaurant & Catering, Stone House Sweets Bakery & Coffee House and more. Enjoy beers throughout the evening and gain an in-depth knowledge of local craft brewing. Expert brewers will lead informative tasting sessions where you will gain a deeper appreciation of these beers through discussion. Locally brewed beer from brewers such as Warped Wing Brewing Company, Hairless Hare Brewery, and Fifth Street Brewpub will be there, while Bonbright Distributors will bring Great Lakes Brewing Co. features, Miller Lite, and several regional craft beers as well. Wine will also be available. An extra treat awaits as the Sugargrove Bluegrass band provides the perfect toe-tappin’ bluegrass music for spending time with friends and neighbors. What could be better than good music, good beer, and good food? This event is for attendees 21 and over only. Tickets are $40 per person, and 100% of your ticket price supports Aullwood’s environmental education programs for local students. Reservations are limited and last year’s event sold out, so get your tickets today! 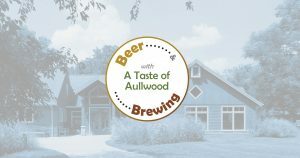 Please RSVP by February 11th by calling 937-890-7360 or completing and returning the registration form in the Beer & Brewing with A Taste of Aullwood brochure.